Arab Leaders meeting Sunday in Saudi Arabia overlooked the airstrikes launched by the USA, France, and the United Kingdom against the Syrian regime’s military installations following charges President Bashar al-Assad military used chemical weapons that killed dozens of people in rebel-held enclave of Douma early this month. The USA, France, and the UK launched strikes on the regime’s alleged military installations linked to the country’s chemical weapons program. The three UN Security Council permanent members hit the regime for its alleged killing of several people in Douma with chemical bomb. Damascus and its strategic ally, Moscow, refute the accusation. The air strikes according to the opposition hit Iran and Lebanon-controlled military bases. Iran and its Lebanon Shia allies have been propping up the Syrian regime, helping it to emerge gradually from the seven-year old conflict. 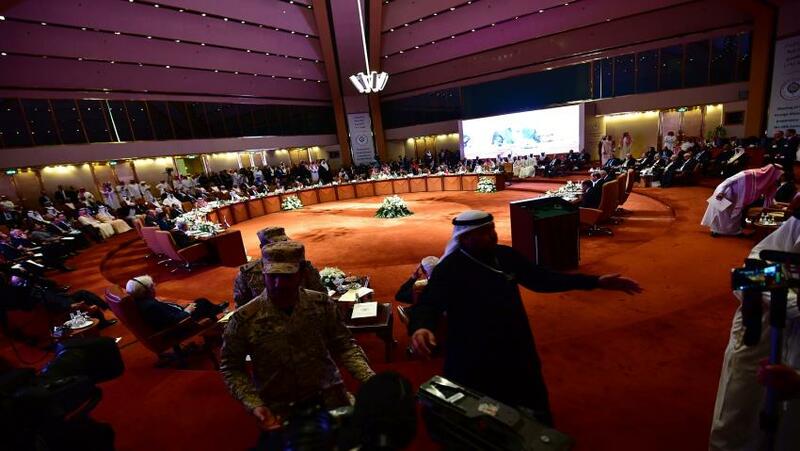 Arab countries have been divided over the strikes. While Saudi Arabia, Bahrain, and Oman have welcomed the military aerial operations, Algeria, Egypt, Iraq, Morocco and Tunisia have opposed the western moves. King Salman of Saudi Arabia made no mention of the strikes in his opening address before the Arab Summit and Crown Prince Mohamed bin Salman, last week during a visit to France, reportedly endorsed western responses to the alleged use of chemical weapons by the Syrian regime. Yet, in the final declaration issued by the Summit, Arab countries said they had “followed the actions of the Western forces in Syria”. Stressing the need to join efforts to reach a political solution to the Syrian crisis, they underlined their “absolute condemnation of the use of chemical weapons against the brotherly Syrian people” and called for an independent international investigation that includes the implementation of international law. They however emphasized the need to find a political solution to end the crisis, “in order to fulfil the aspirations of the Syrian people who is under the aggression, preserve the unity of Syria, protect its sovereignty and independence, and end the presence of all external forces and sectarian terrorist groups”. “There is no way to stop bloodshed except by reaching a peaceful settlement that achieves a real transition to a political reality shaped and agreed upon by all the components of the Syrian people through the Geneva track, which is the only framework for the peaceful solution, and we are committed to the international community’s efforts to alleviate human suffering in Syria to avoid new humanitarian crises,”.